Pluto lost its status as a planet only recently. Seeing Pluto sad on being rejected thus, my heart sinks. It is so far away, so tiny, so all my teeny-weeny poems I gift to it,' says Gulzar. 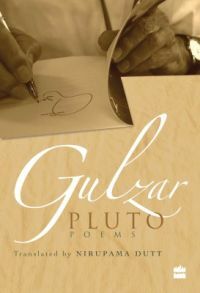 In this wonderful collection of short poems, Gulzar addresses his pet themes - relationships, God or his absence, nature and the nature of Time itself, with characteristic wit and brevity.Beautifully rendered into English by Nirupama Dutt, this is a collection to savour and treasure. Gulzar is arguably India's most well-known poet writing in Hindustani today. An acclaimed film-maker, lyricist and author,he is the recipient of a number of Filmfare and National Awards, the Oscar for Best Lyricist and the Dadasaheb Phalke Award.Nirupama Dutt is a poet, journalist, literary and art critic and translator of many seasons. She writes in both Punjabi and English. She received the Punjabi Akademi Award for her anthology of poems, Ik Nadi Sanwali Jahi.